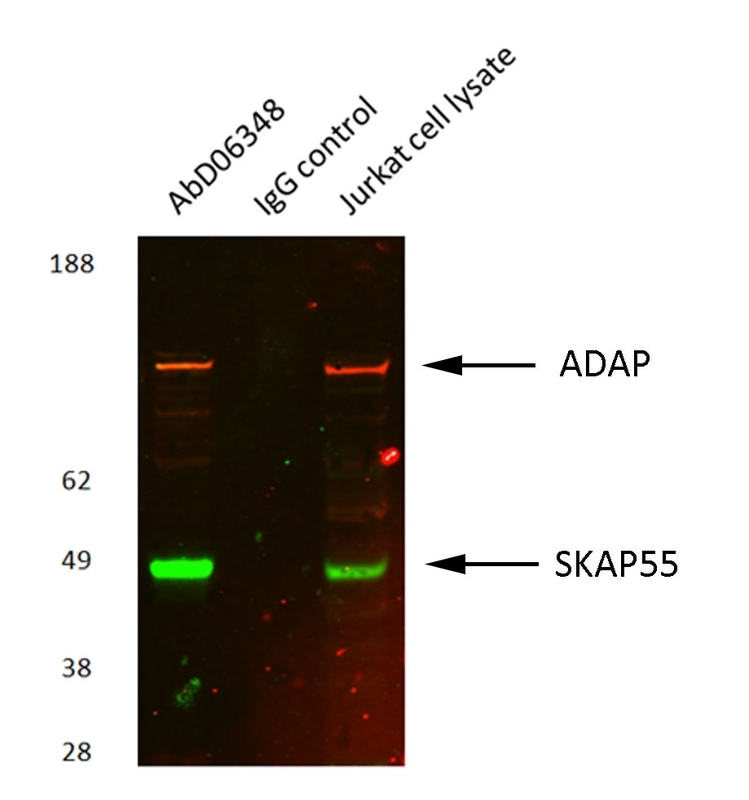 Human anti Human ADAP antibody, clone AbD06348 recognizes the human molecular adaptor protein adhesion- and degranulation-promoting (ADAP). Adaptor proteins are essential components of the T-cell receptor (TCR) signaling cascade, regulating gene transcription and cytoskeletal re-organisation. ADAP is a 130 kDa molecule which interacts with several intermediates of the T-cell signaling cascade including SLP-76, FYN and VASP. The ADAP molecule is expressed on hematopoietic tissues and is reported to have multiple functions downstream of the TCR that promote optimal T lymphocyte response to antigen. In particular, ADAP is reported to function as a positive regulator of T-cell activation, LFA-1 integrin clustering following TCR ligation and T-cell adhesion. A bivalent human recombinant Fab selected from the HuCAL® phage display library, expressed in E. coli. The antibody is tagged with a myc-tag (EQKLISEEDL) and a his-tag (HHHHHH) at the C-terminus of the antibody heavy chain. This Fab fragment is dimerized via a helix-turn-helix motif. This antibody is supplied lyophilized.